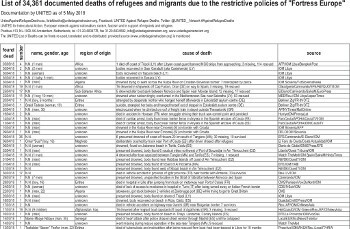 In the period 1993-2018 more than 34,361 deaths can be put down to border militarisation, asylum laws, detention policies and deportations. Most probably thousands more are never found. The fatal results already reach the daily headlines: bodies that surface on European shores, stowaways found in the back of a truck, or asylum seekers who kill themselves consequential to hard living conditions and depression for the long and lingering asylum claim decision. These are the consequences when Europe shuts its doors and eyes. Our message has been the same over the years - with increasingly higher numbers - each unnecessary death is one too many. How big must our message get before something will CHANGE? We need to wake up policy-makers and show them the human costs of their decisions. The aim of this „Fatal Policies of Fortress Europe“ campaign is to raise public attention and denounce the exclusionist policies of the EU. It is extremely important for the purposes of the campaign to raise awareness on this issue throughout Europe. The main targets are media and the general public. With their help it is possible to force European politicians to reconsider European immigration policies and to develop a human vision on migration.